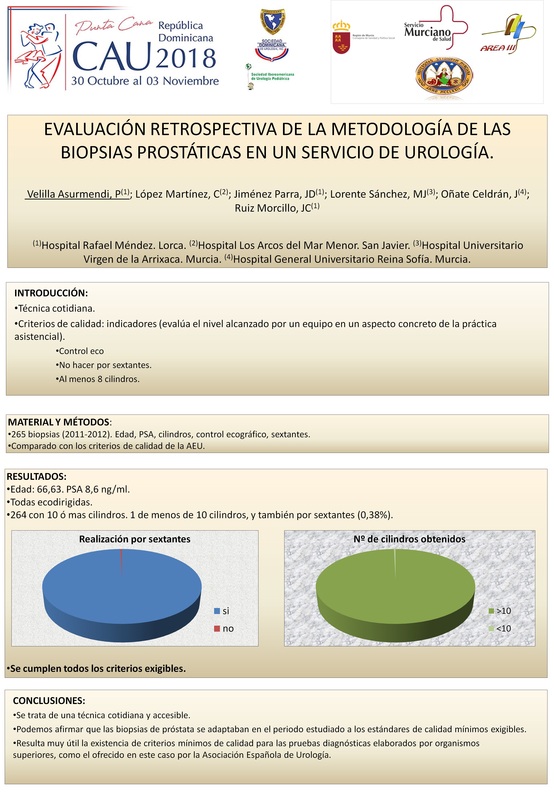 P-02 EVALUACIÓN RETROSPECTIVA DE LA METODOLOGÍA DE LAS BIOPSIAS PROSTÁTICAS EN UN SERVICIO DE UROLOGÍA. 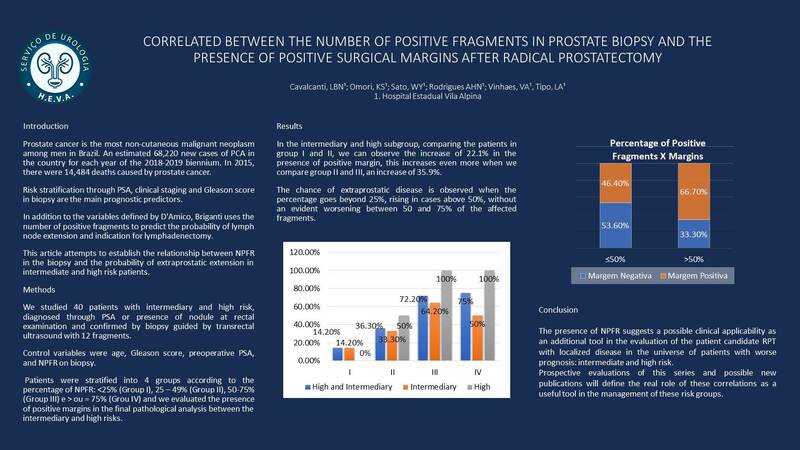 P-08 TRATAMIENTO CONSERVADOR DE FISTULA RECTO-VESICAL TRAS PROSTATECTOMÍA RADICAL. 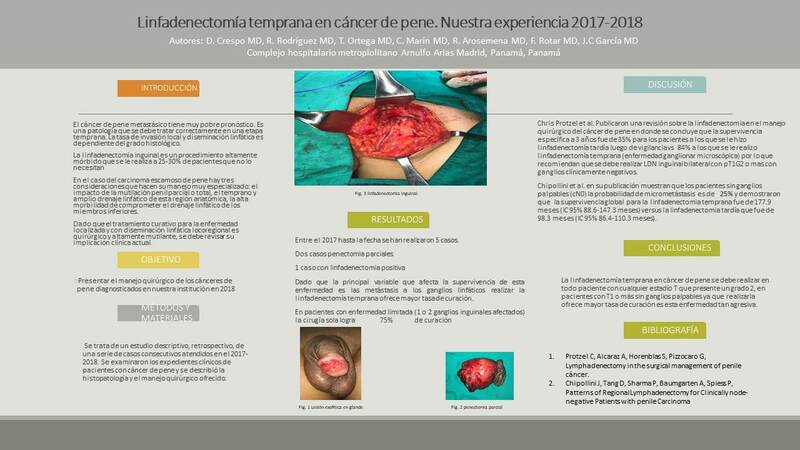 NUESTRA EXPERIENCIA EN 3 PACIENTES. 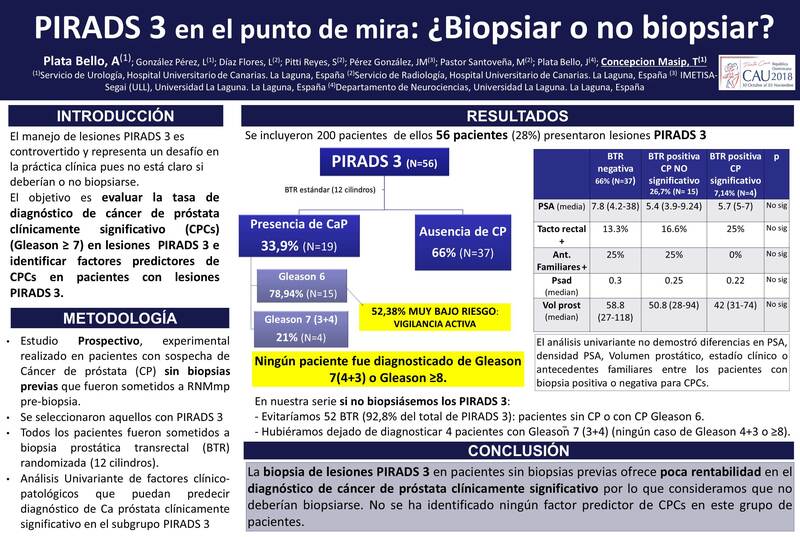 P-09 PIRADS 3 EN EL PUNTO DE MIRA: ¿BIOPSIAR O NO BIOPSIAR? 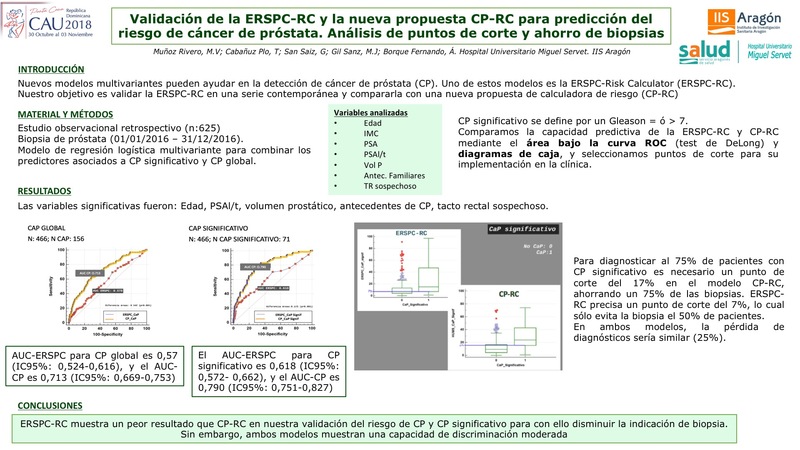 P-10 VALIDACIÓN DE LA ERSPC-RC Y LA NUEVA PROPUESTA CP-RC PARA PREDICCIÓN DEL RIESGO DE CÁNCER DE PRÓSTATA. 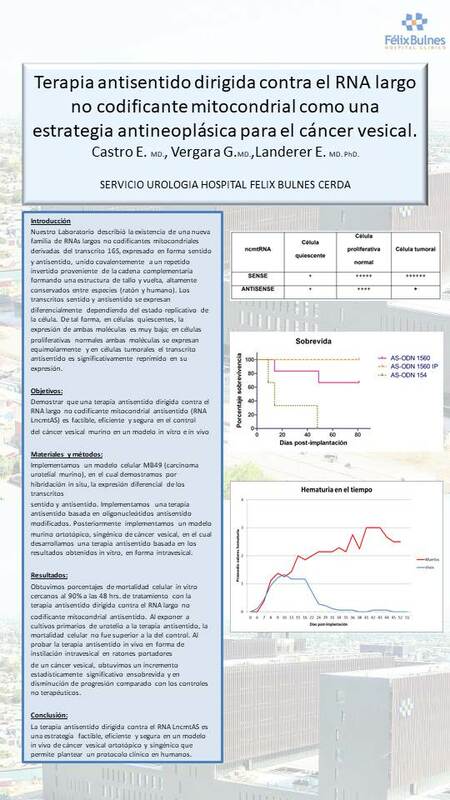 ANÁLISIS DE PUNTOS DE CORTE Y AHORRO DE BIOPSIAS. 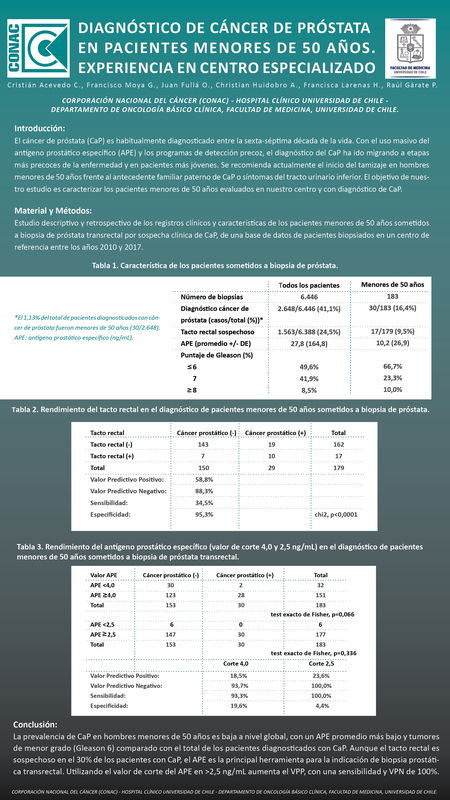 P-11 RESULTADOS ONCOLÓGICOS DE LA BRAQUITERAPIA EN TIEMPO REAL DINÁMICO CON YODO 125, EN PACIENTES CON CÁNCER DE PRÓSTATA. 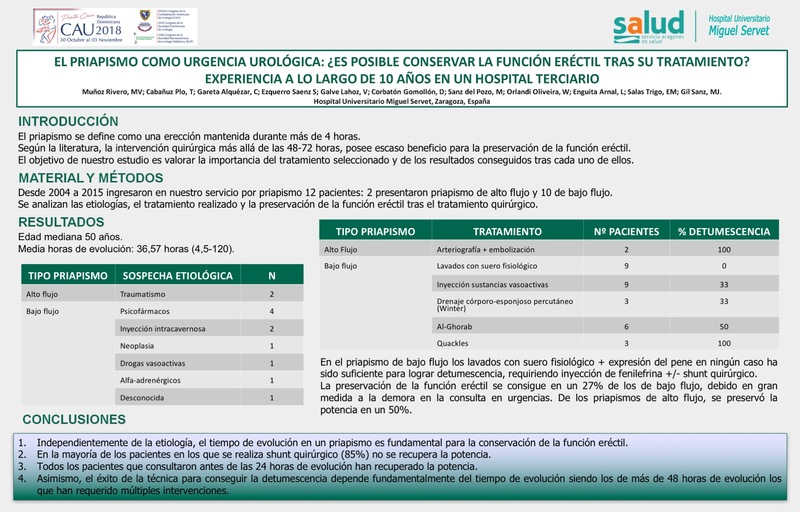 P-110 EL PRIAPISMO COMO URGENCIA UROLÓGICA: ¿ES POSIBLE CONSERVAR LA FUNCIÓN ERÉCTIL TRAS SU TRATAMIENTO? 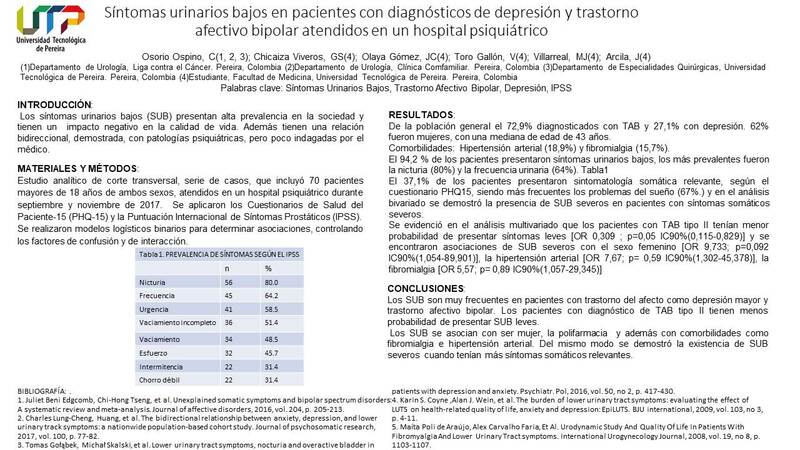 EXPERIENCIA A LO LARGO DE 10 AÑOS EN UN HOSPITAL TERCIARIO. 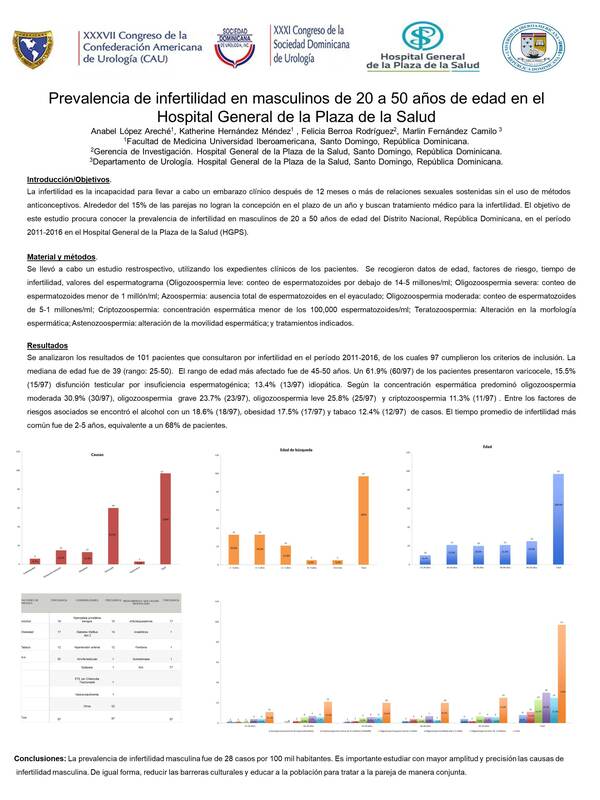 P-12 MORBILIDAD DE LA BRAQUITERAPIA EN TIEMPO REAL DINÁMICO CON YODO 125, EN PACIENTES CON CÁNCER DE PRÓSTATA. 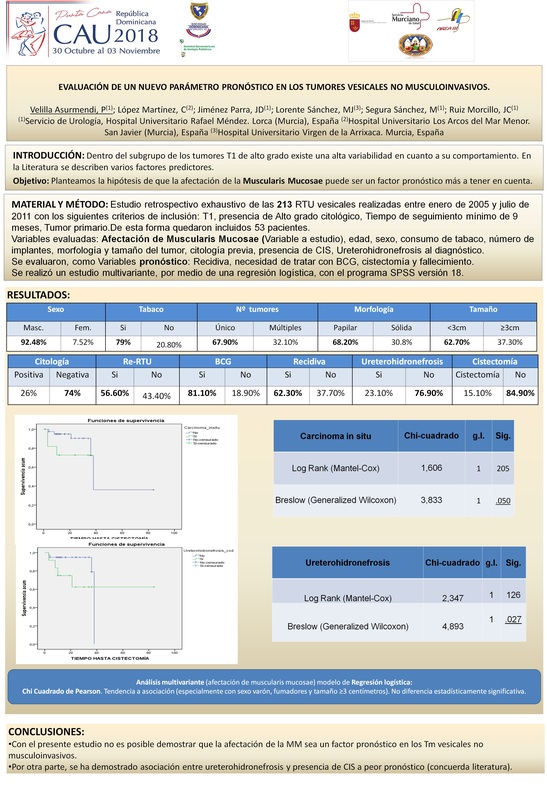 P-22 HIDROCELE ATÍPICO: MESOTELIOMA PAPILAR BIEN DIFERENCIADO DE LA TÚNICA VAGINAL TESTICULAR. A PROPOSITO DE UN CASO Y REVISIÓN DE LA LITERATURA. 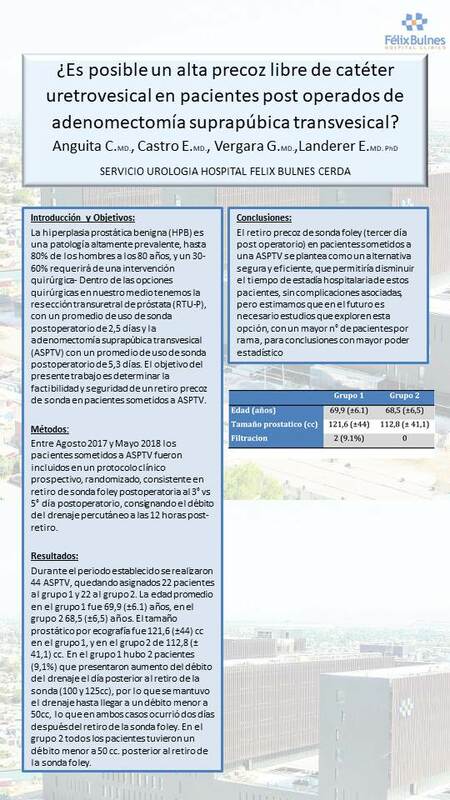 P-31 EVALUACIÓN DE UN NUEVO PARÁMETRO PRONÓSTICO EN LOS TUMORES VESICALES NO MUSCULOINVASIVOS. 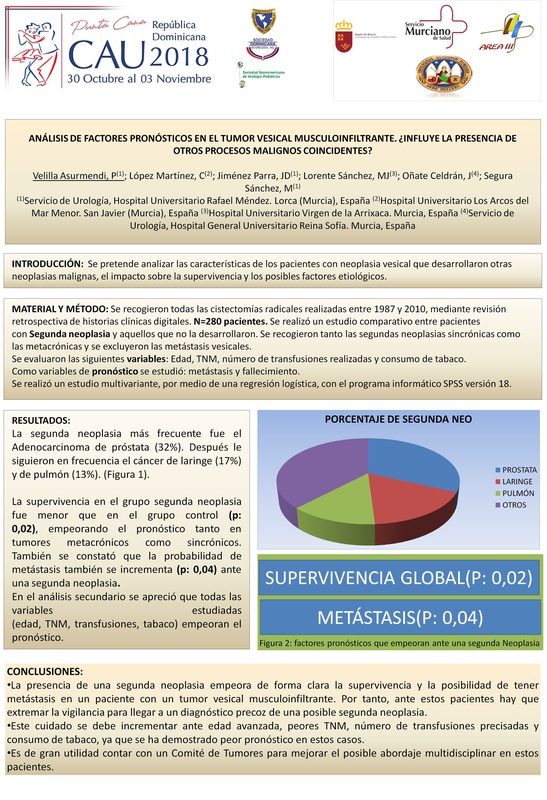 P-32 ANÁLISIS DE FACTORES PRONÓSTICOS EN EL TUMOR VESICAL MUSCULOINFILTRANTE. 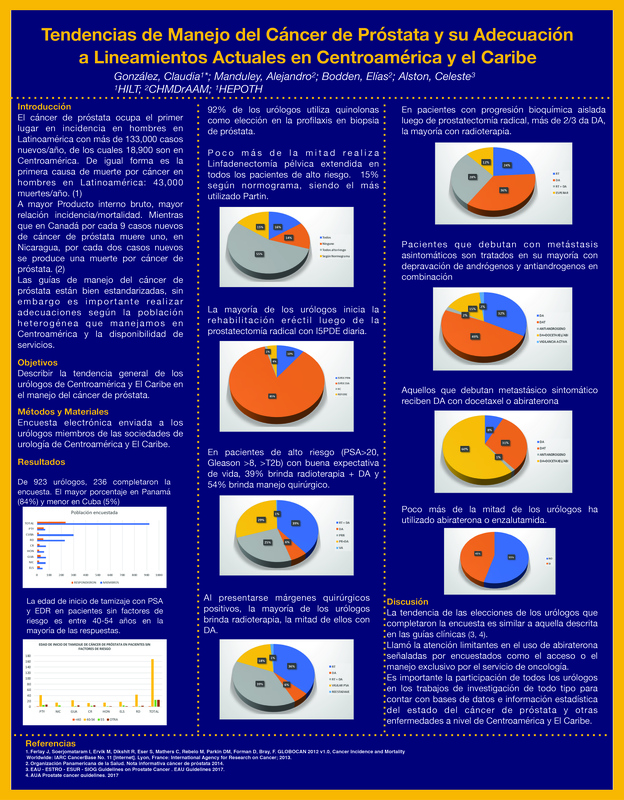 ¿INFLUYE LA PRESENCIA DE OTROS PROCESOS MALIGNOS COINCIDENTES? 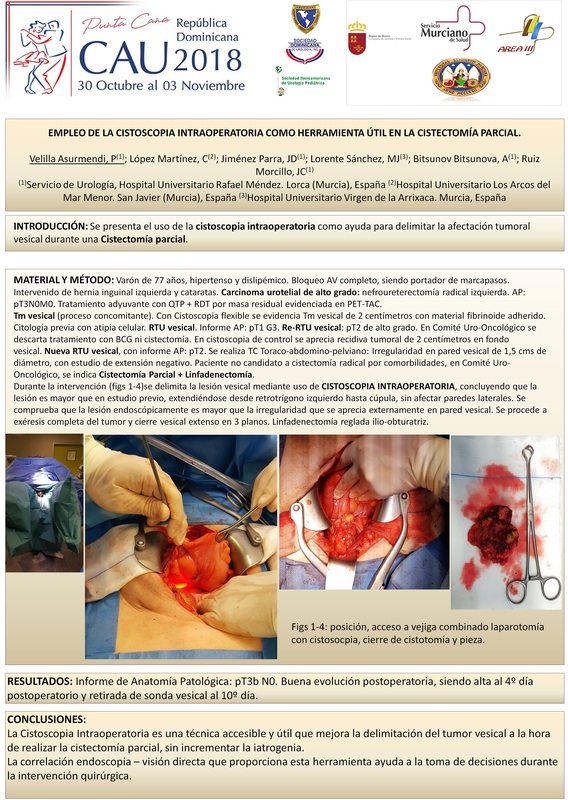 P-33 EMPLEO DE LA CISTOSCOPIA INTRAOPERATORIA COMO HERRAMIENTA ÚTIL EN LA CISTECTOMÍA PARCIAL. 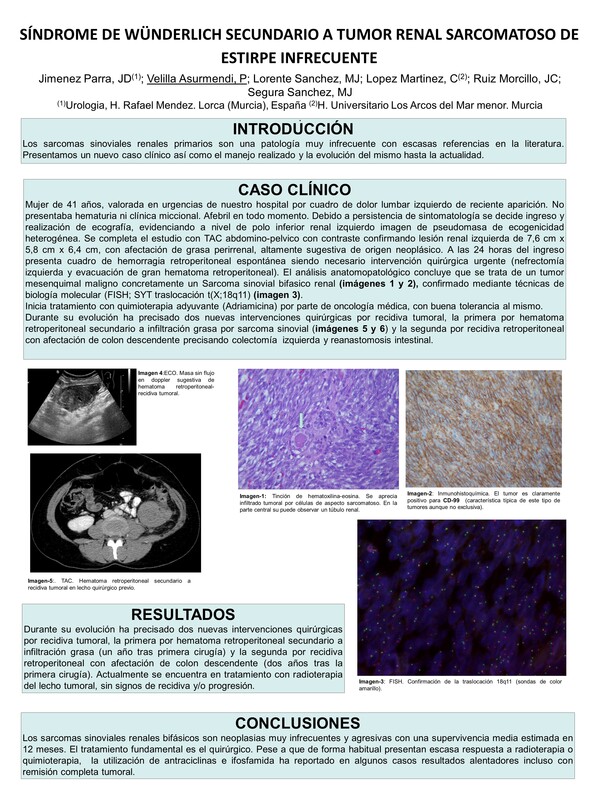 P-34 NON-FUNCTIONAL PARAGANGLIOMA OF THE URINARY BLADDER POST-BCG INTRAVESICAL IMMUNOTHERAPY. 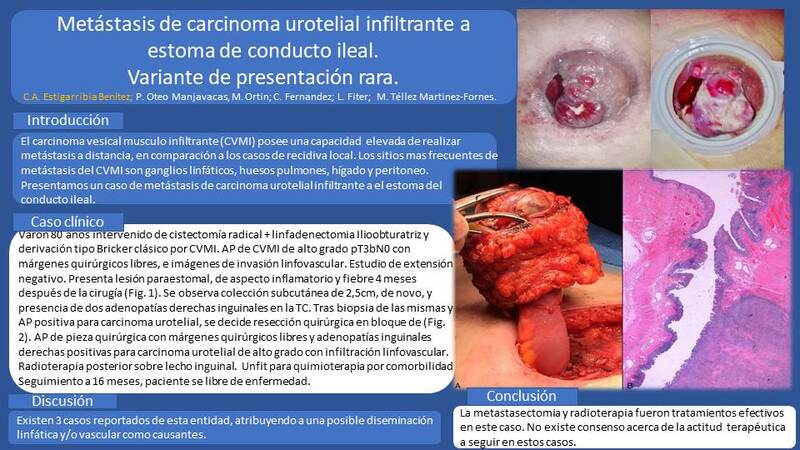 P-35 METÁSTASIS EN ESTOMA DE CONDUCTO ILEAL DE CARCINOMA UROTELIAL INVASIVO TRAS CISTECTOMIA RADICAL. 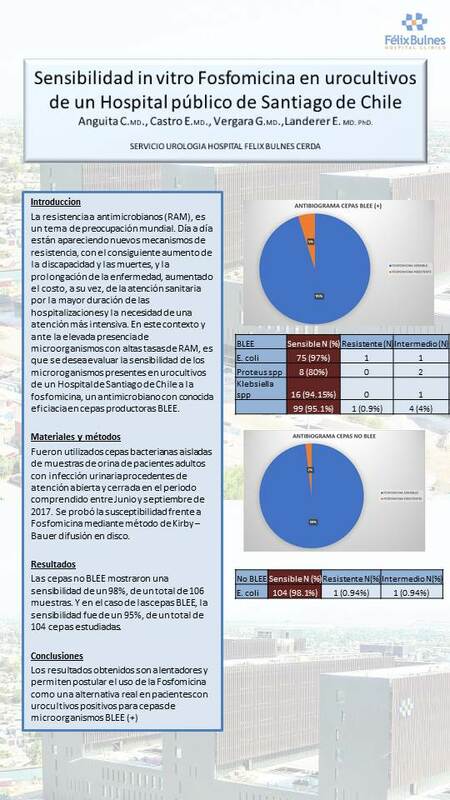 VARIANTE DE PRESENTACIÓN RARA. 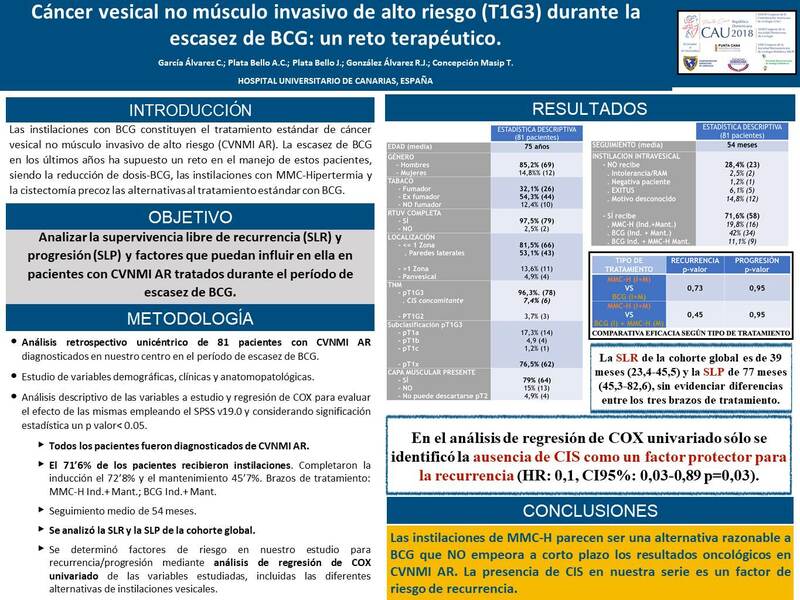 P-37 CÁNCER VESICAL NO MÚSCULO INVASIVO DE ALTO RIESGO (T1G3) Y ESCASEZ DE BCG: UN RETO TERAPÉUTICO. 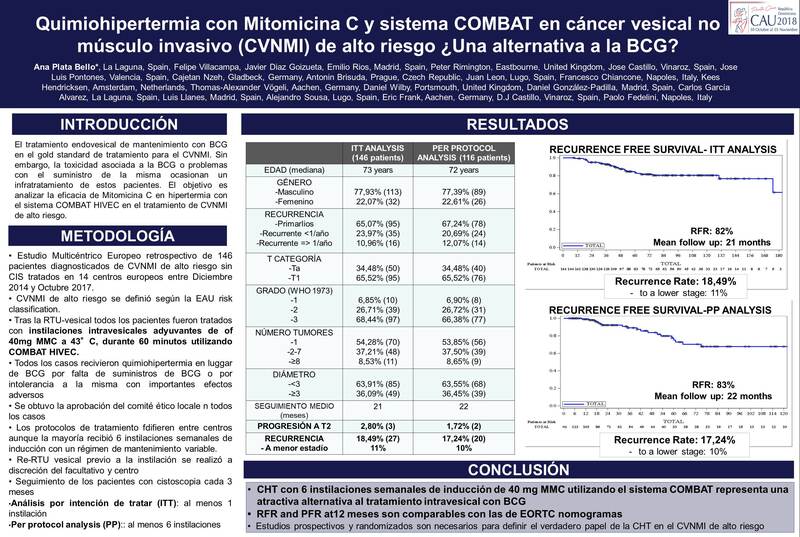 P-38 QUIMIOHIPERTERMIA CON MITOMICINA C Y SISTEMA COMBAT EN CÁNCER VESICAL NO MÚSCULO INVASIVO (CVNMI) DE ALTO RIESGO ¿UNA ALTERNATIVA A LA BCG? 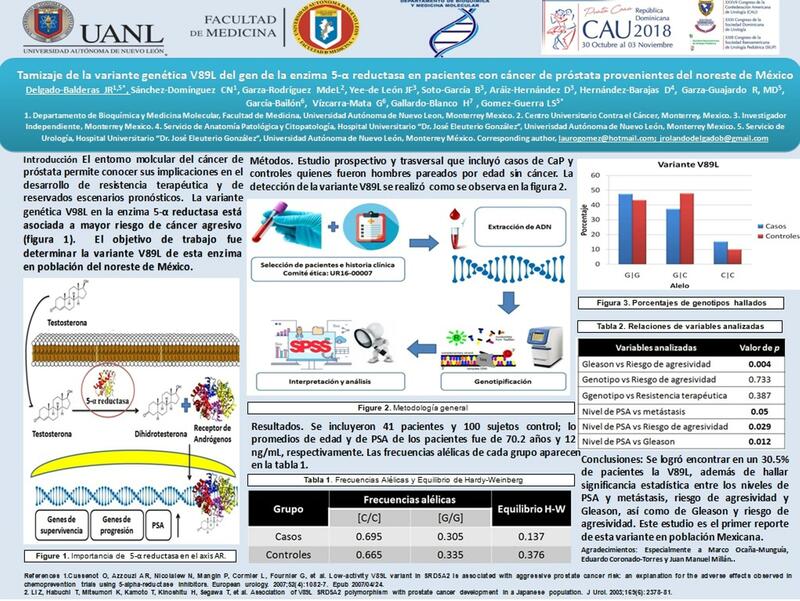 P-66 TERAPIA ANTISENTIDO DIRIGIDA CONTRA EL RNA LARGO NO CODIFICANTE MITOCONDRIAL COMO UNA ESTRATEGIA ANTINEOPLÁSICA PARA EL CÁNCER VESICAL. 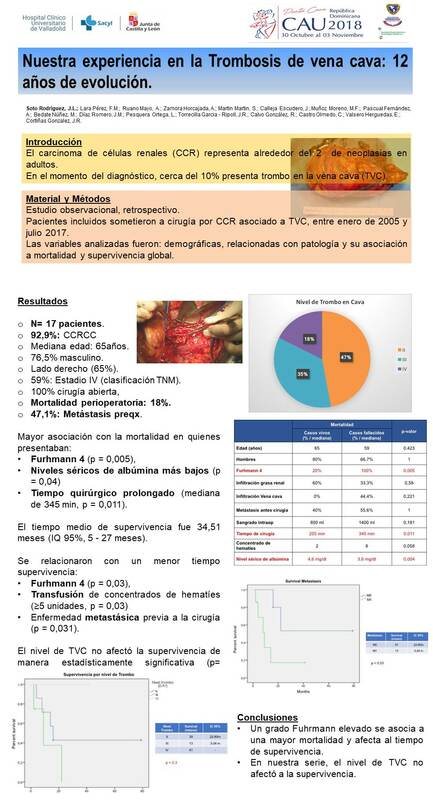 P-69 NUESTRA EXPERIENCIA EN LA TROMBOSIS DE VENA CAVA: 12 AÑOS DE EVOLUCIÓN. 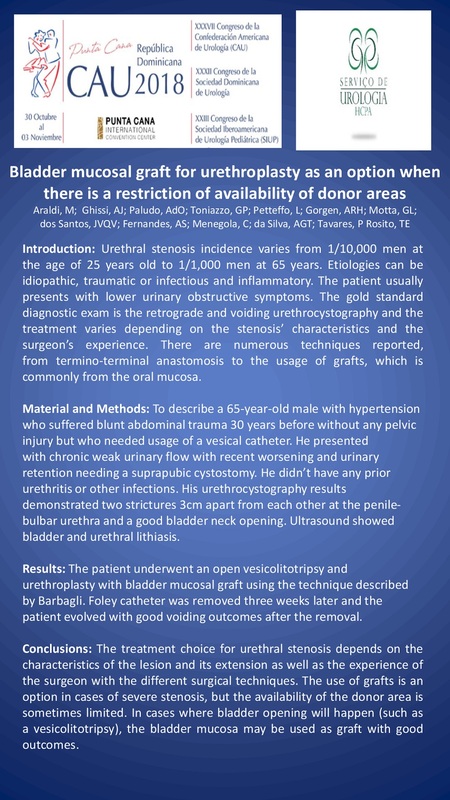 P-77 VENTRAL URETHROPLASTY WITH VAGINAL FLAP - PROSPECTIVE ASSESSMENT OF 19 PATIENTS. 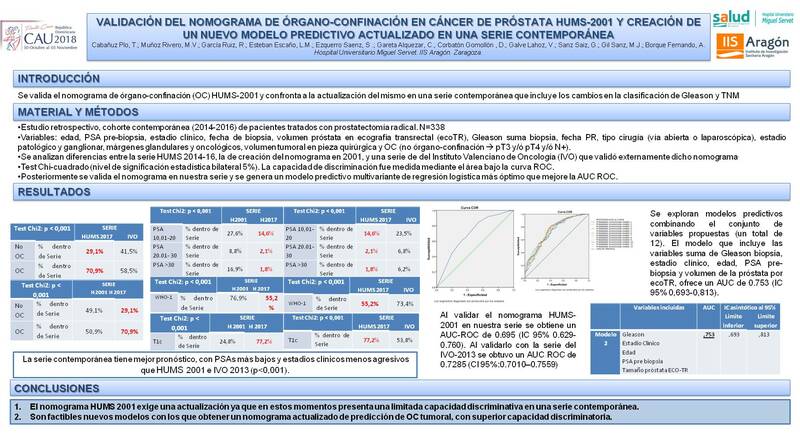 P-91 ¿ES POSIBLE UN ALTA PRECOZ LIBRE DE CATÉTER URETROVESICAL EN PACIENTES POSTOPERADOS DE PROSTATECTOMÍA SIMPLE? 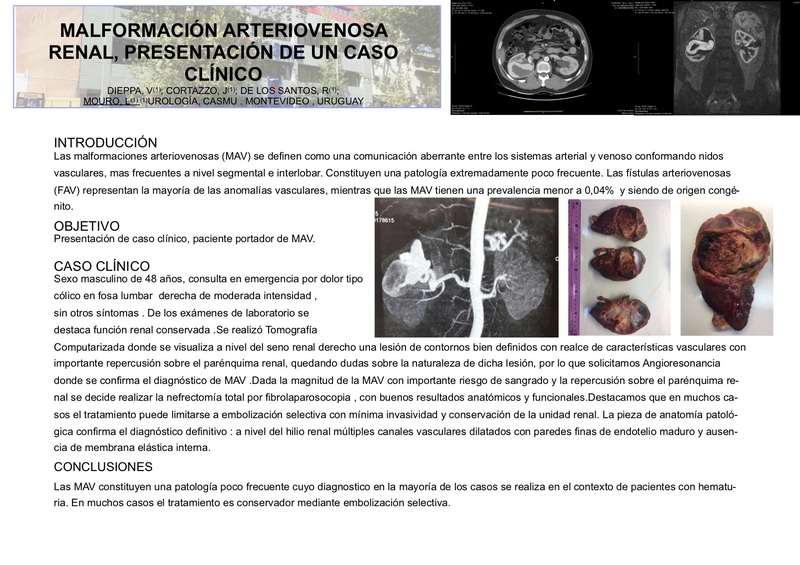 V-01 CIRUGÍA INTRARRENAL RETRÓGRADA EN LITIASIS MAYORES A 2 CENTÍMETROS. 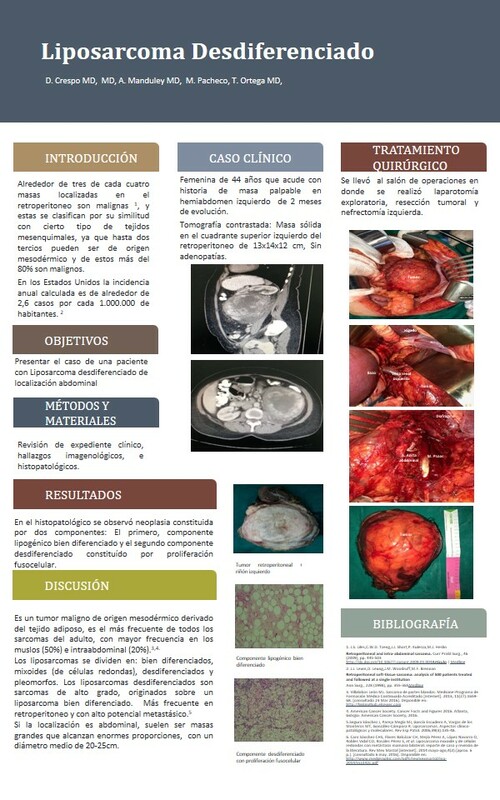 TÉCNICA QUIRÚRGICA. 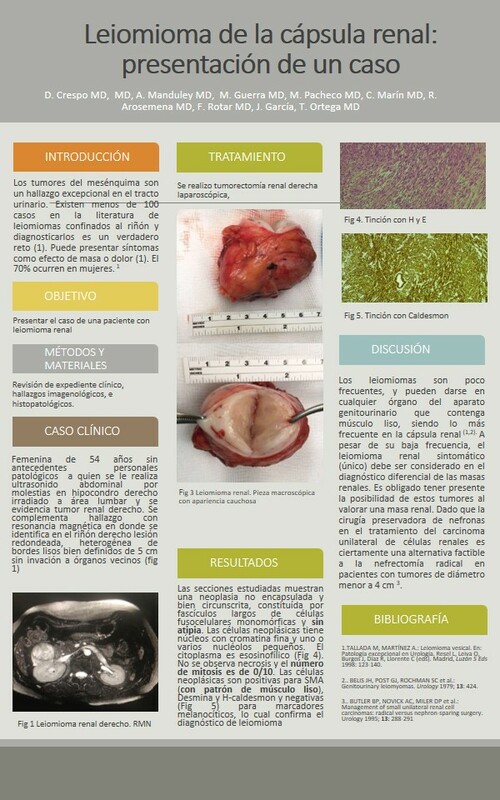 V-02 RESOLUCIÓN ENDOSCOPICA DE ESTENOSIS DE ANASTOMOSIS URETEROINTESTINAL EN DERIVACIÓN URINARIA TIPO BRICKER. 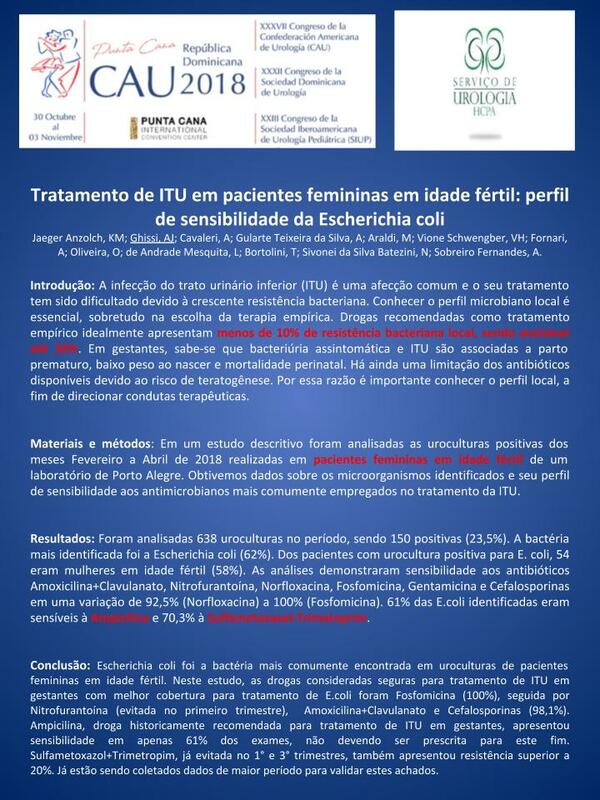 V-08 GANCHO PARA RETIRO DE CATÉTER JJ: MÉTODO EFICAZ, ECONÓMICO Y SEGURO. 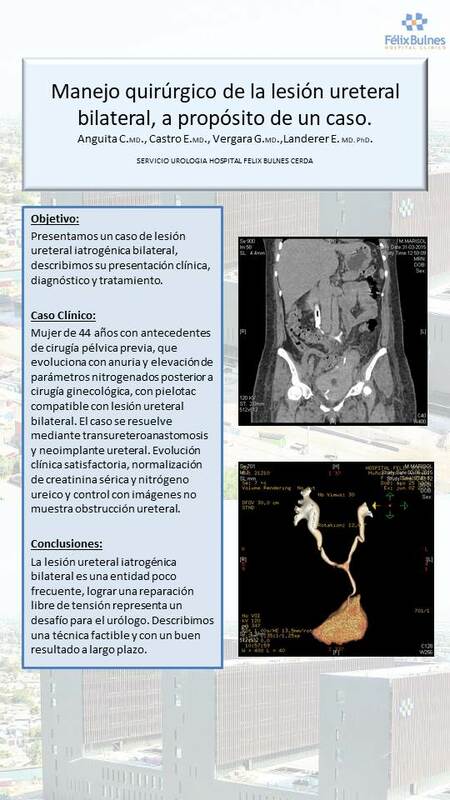 REVISIÓN Y PRESENTACIÓN DE GANCHO PARA RETIRO DE STENT URETERAL EN EL PACIENTE FEMENINO. V-16 GRAYHACK, UNA OPCIÓN EN EL PRIAPISMO DE BAJO FLUJO. 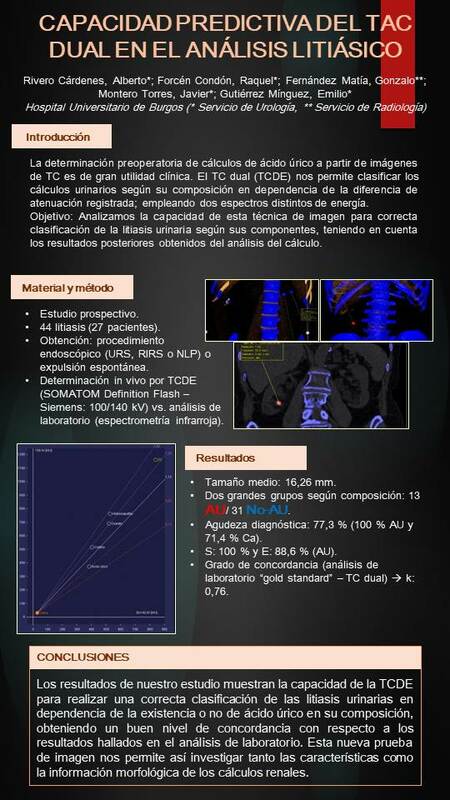 V-20 EXÉRESIS LAPAROSCÓPICA DE VESÍCULA SEMINAL DERECHA MULTIQUÍSTICA EN PACIENTE CON SÍNDROME DE ZINNER. 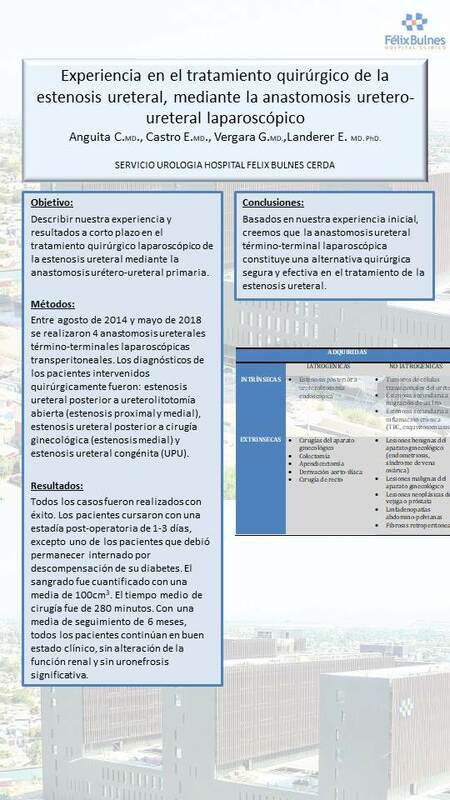 V-23 NEFRECTOMÍA PARCIAL LAPAROSCÓPICA. 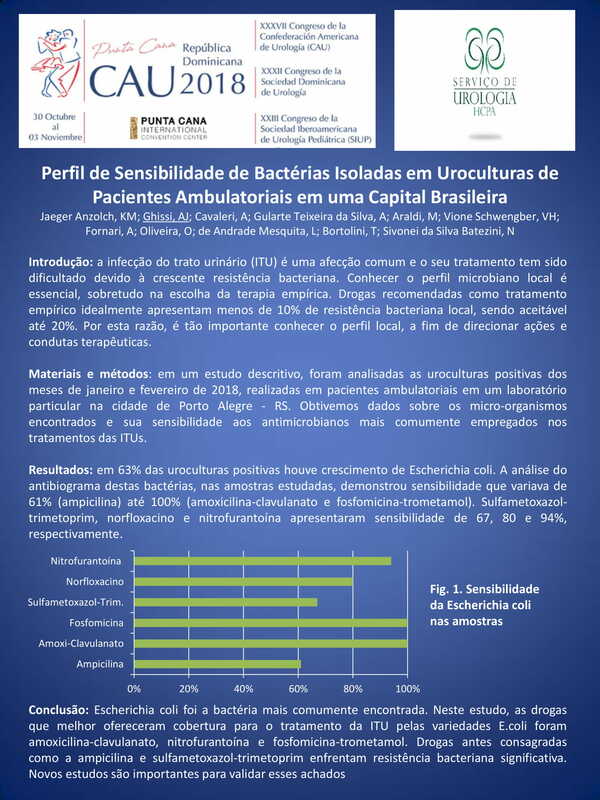 CIERRE DE LA HERIDA CON SUTURA BARBADA ABSORBIBLE V-LOC. 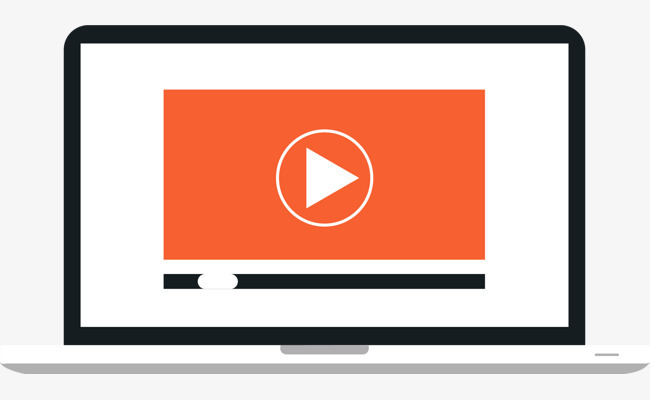 V-26 OBTURATOR NERVE SECTION : WHAT NOW? 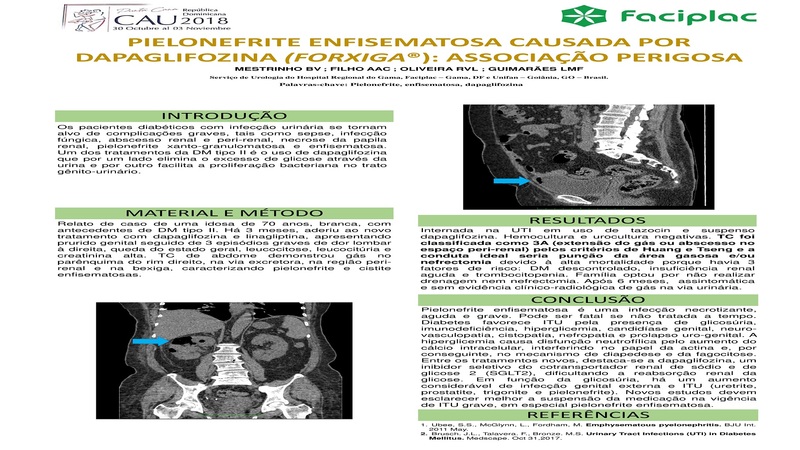 V-28 CISTECTOMIA PARCIAL ASISTIDA POR ROBOT POR CANCER DE VEJIGA EN UN DIVERTICULO VESICAL. 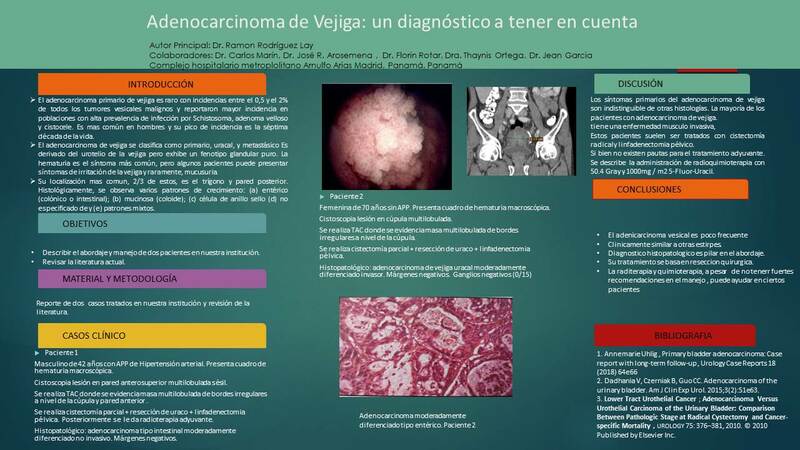 V-29 EXÉRESIS VIDEOLAPAROENDOSCÓPICA DE METÁSTASIS INGUINAL POR CARCINOMA DE CAVUM. 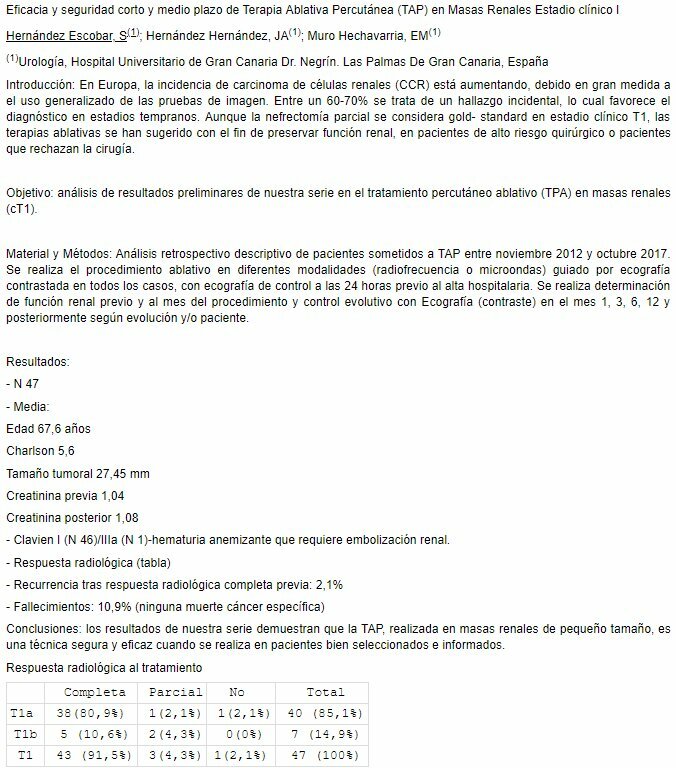 V-40 VALIDACIÓN EN MANEJO DE COMPLICACIONES EN CIRUGÍA LAPAROSCÓPICA: MODELO ANIMAL. 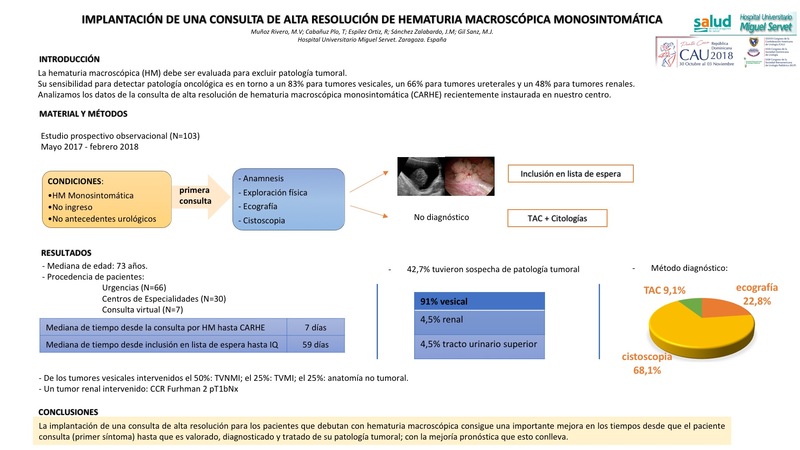 V-41 MANEJO LAPAROSCÓPICO DE LA UROLITIASIS COMO ALTERNATIVA A PROCEDIMIENTOS ENDOUROLÓGICOS. 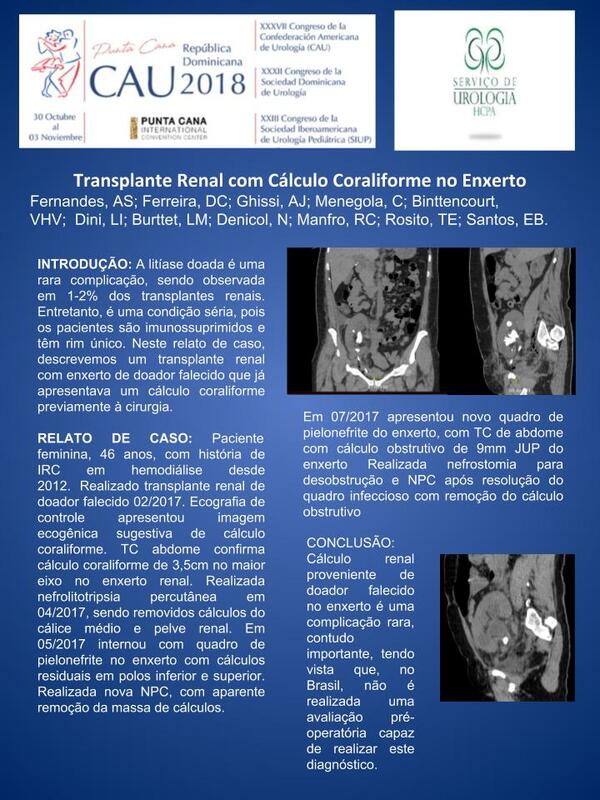 V-42 LIGADURA DEL HILIO RENAL DIFÍCIL EN NEFRECTOMÍA LAPAROSCOPICA: CÓMO LO HEMOS HECHO. V-56 CISTECTOMÍA ORTOTÓPICA ROBÓTICA INTRACORPÓREA. TRUCOS Y PASOS CRÍTICOS. 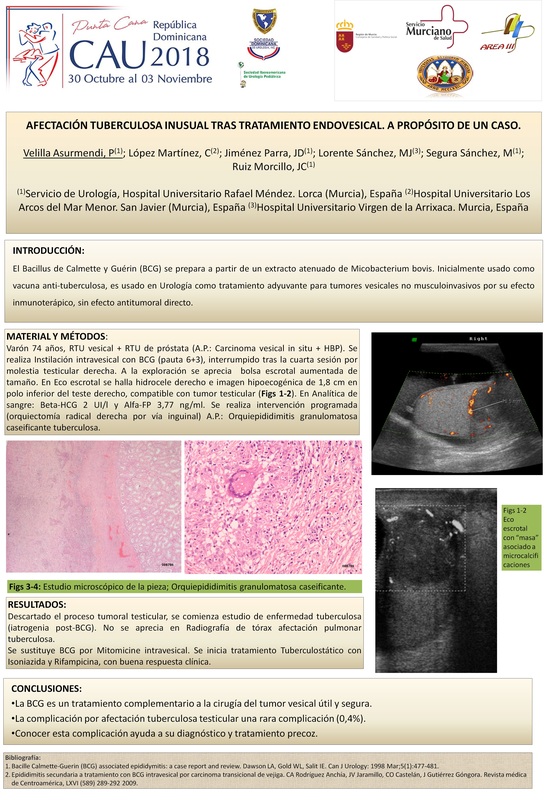 V-62 CISTECTOMÍA PARCIAL LAPAROSCÓPICA Y RESECCIÓN DE INTESTINO DELGADO CON ENTERO-ENTERO ANASTOMOSIS TERMINO-TERMINAL POR ADENOCARCINOMA DE URACO. 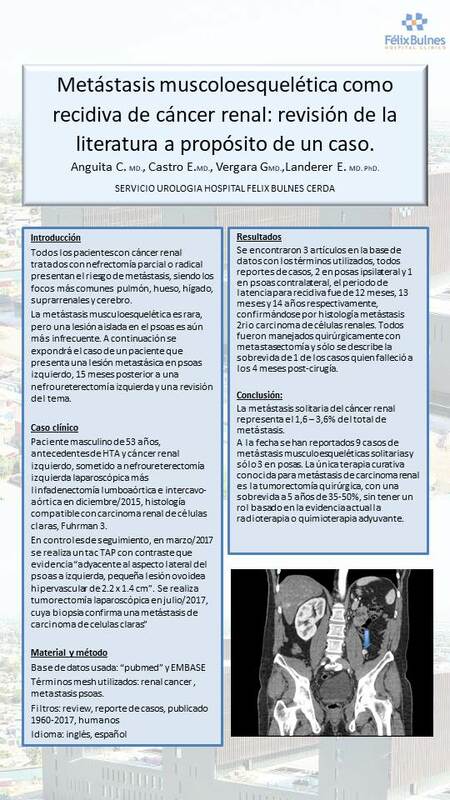 V-64 URETEROSCOPÍA SEMIRRÍGIDA EN EL TRATAMIENTO DE TUMOR UROTELIAL DE PELVIS RENAL EN RIÑÓN EN HERRADURA.